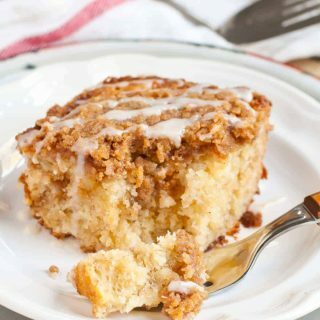 For a breakfast treat or after dinner sweet, this ultra moist, buttery, cinnamon spiked Banana Crumb Cake hits the spot. Sometimes a recipe seems to come to me by pure serendipity. A few months ago, my friend made a banana cake for our weekly breakfast gathering. I’ve mentioned our breakfast crew several times before. It’s where I got this recipe for Easy Caramel Monkey Bread and the best Buttermilk Syrup. This particular banana cake was super moist with a crunchy brown sugar crumb topping. It was dessert masquerading as breakfast, and I couldn’t have been happier about it. All of us requested the recipe, and I made a note to make it as soon as I had the chance. Of course, weeks passed and I completely forgot about it. Then one day, I had a few black spotted bananas to use up, and I asked Will to scroll through my Pinterest feed and pick out a banana recipe for me to make. He immediately chose a banana crumb cake that looked suspiciously like one I had eaten just a few weeks earlier. I clicked on the recipe then compared it to the one my friend had sent in an email. Sure enough, they were nearly identical. Clearly, I was meant to make this banana cake…immediately. I was pleasantly surprised to find the batter comes together in no time, and we were soon greeted with the smells of warm cinnamon and brown sugar. We were too impatient to let the cake cool, so we cut ourselves fat slices and drizzled it with glaze while it was still warm and fragrant. The secret to this ultra moist cake is the layer of crumbs in the middle. Brown sugar, butter, and cinnamon crumb combine to make both the filling and the topping. The crumbs in the center disappear during baking, leaving their buttery, spicy warmth behind. The crumbs on top get golden brown and crunchy, forming the perfect crispy crumb topping. This cake is definitely sweet enough to serve as is, but when we’re feeling extra decadent, we like to top it off with a simple powdered sugar glaze. The glaze melts into all the nooks and crannies, making this cake so good, you might find yourself letting bananas rot just so you can make it. 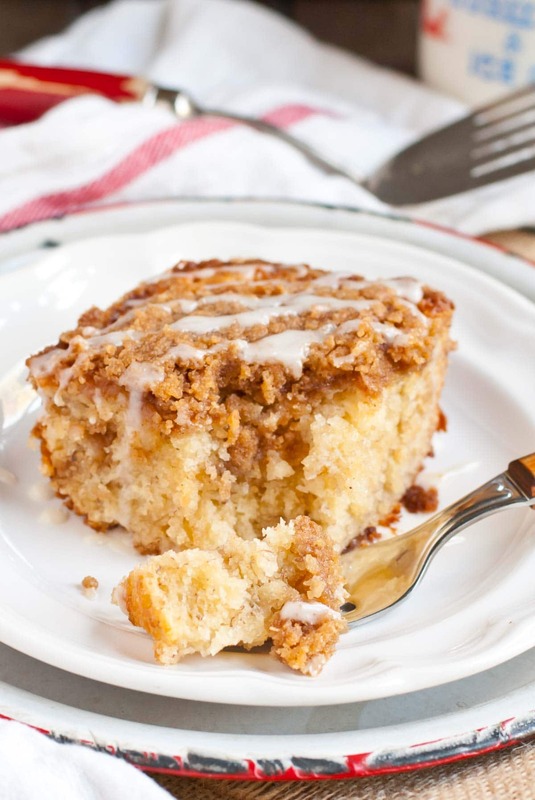 Moist, sweet Banana Crumb Cake with a crunchy buttery brown sugar and cinnamon crumb topping. Preheat the oven to 350 degrees. Grease a 9 x 13 inch pan. In a small bowl, whisk together the flour, baking powder, and salt. In another large bowl, mash the bananas. Beat in the butter until well combined. The butter will likely not incorporate all the way and might look separated. This is just fine! Add the sugar, eggs, and vanilla and beat until combined. Stir in the flour and milk alternately, beginning and ending with the milk. Set aside. In another bowl, combine all of the crumb ingredients and use a pastry cutter or forks to cut in the butter until pea sized crumbs form. Pour half of the cake batter into the prepared pan then layer with half of the crumbs. Pour the remaining batter on top followed by the rest of the crumbs. Bake in the preheated oven for 45-55 minutes or until a toothpick inserted in the center comes out clean. Remove from oven and allow to cool for 10 minutes. Whisk together the glaze ingredients in a measuring cup then drizzle over the cake. Serve warm or at room temperature. Cake will keep for 3 days in a covered container, but the crumbs will lose their crunch after the first day. I hope you try it and love it! Thanks for commenting! My daughter and I just love this recipe and she had so much fun making it with me!! We are still enjoying it – super yummy!!! I am so glad you and your daughter got to enjoy this together. What a fun memory! Hi, could you tell me the measurements in grams? I never used the cups measurements. I find it very hard. I love the recipe. I recommend using a cup to gram converter like this: http://www.convertunits.com/from/cups/to/grams. I forgot to add the vanilla and just put it in the oven. 🙁 will this make a big difference how it turns out? Don’t worry about it! It will turn out just fine. Hope you enjoy the cake! The absolute BEST little recipe for banana bread! So moist! It is good warm or cold. Wouldn’t change anything. I am going to try it with other similar fruits, such as persimmon. Yum!! I am so glad you enjoyed this so much! I hope all of your experiments turn out great! I’ve tried this recipe yesterday and my cake had a pudding-like consistency. I’m not sure how this happened but I followed your instructions to a tee… do you have any idea why I didn’t get that cake-like texture? I used a silicone baking cake pan as well. Hmmm…it’s so hard to know without being in the kitchen with you. I would guess it was underbaked a bit. I’ve never really baked cakes in silicone pans…that might affect the baking time or temperature. I’m sorry it didn’t turn out for you! I baked this cake just today, and I also ended up with a pudding like consistency. It’s delicious, and toothpicks in the center came out clean, it’s just that I didn’t end up with cake~like texture, but more dense. In addition, I used a 9 x 13 glass pan. Are there any hints that I could use to perhaps next time have a more cake~like texture, do you think? It’s so hard to say without being in the kitchen with you, but I would guess it probably needed to be baked a bit longer. I’m sorry it didn’t turn out quite like a cake, but I’m glad it was still delicious! Just want to know this is absolutely delicious and since making it the first time, have shared the recipe with so many people, all raving over this. Today I am trying with rice flour…hope it tastes just as good. thanks for sharing! I am so glad to hear that! Let me know how the rice flour works! The rice flour was a huge success…all my gluten free buds raved over it and the leftovers home! I just took the time and made this cake exactly as instructed, baked in a glass 9 x 13 for 60 minutes…turned out PERFECT! Thank you.for this recipe, I’m making it now my house smells like heaven. I.can’t wait for that first piece . Awesome! I hope it was delicious! Great recipe! I accidentally only used half a cup of milk but it still turned out. Thank you for the recipe! So glad it turned out and you enjoyed it. Thanks for coming back to let me know! It took 1 hour 40 mins at 180C to cook the cake so be warned. It does taste very nice though. Hi. I just tried making this recipe. Do you cream butter before you add banana? I tried beating butter and banana together but it didn’t mix well. Butter was room temperature but when I mixed it with banana, butter was very lumpy. That can definitely happen, but it should still turn out just fine when you mix everything together! 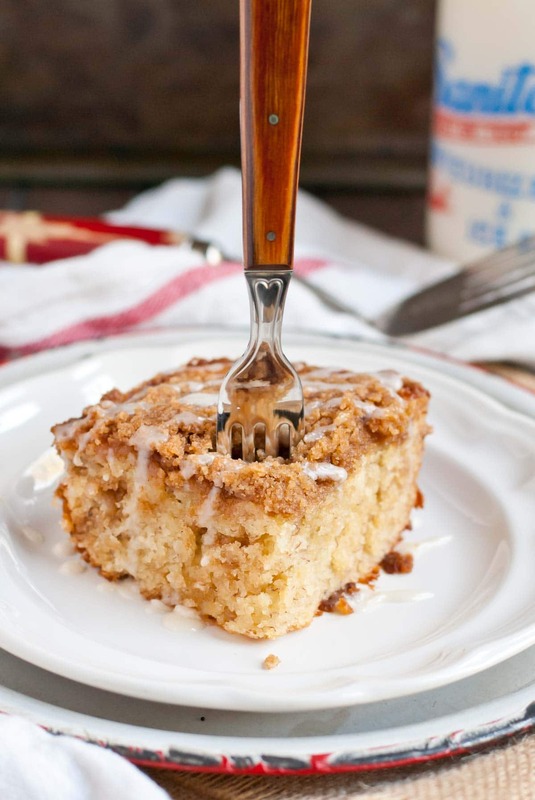 Coffee cake is my favorite thing to bake – and believe me when I say I’ve baked MANY. I made this one this weekend and there’s no going back. It’s the best coffee cake I’ve ever tasted. I used bananas that I had frozen and it worked beautifully. I should have added that I creamed the butter, sugar and egg quite well before adding anything else. Also, I covered the cake in glaze, right out of the oven – the next day it was crispy and crunchy and delightful in every way! That is so awesome! I’m so glad you enjoyed it. Thank you for coming back to let me know! It makes my day! Can you freeze the Banana Crumb Cake? Thank you for sharing your recipe. I made it today without glaze. I want to freeze it till Friday. Have you tried freezing it and if so, what was the results? I haven’t frozen this particular cake, but I’ve frozen similar crumb breads and it’s turned out just fine! Could you use buttermilk instead of regular milk? I’ve never tried it, but I imagine it would work! The taste will have a little more tang that way though! This cake is incredible! I made it the second time and it was better than the first time. I think that’s because I cut in cold butter into the crumb mixture. It was really a pain in the neck, but apparently it was worth it because everyone said it was better than the first time. I just made it a third time and realized that you’re only supposed to put half the crumbs down and then top it with crumbs. I didn’t read it right and put all the crumbs in the middle. I will try it there correct way next time… This is just an absolutely marvelous recipe! Could not be better. I’m so glad you enjoy it and that it works well with all the crumbs in the middle. Thanks for coming back to let me know! I only had two bananas on hand so I cut the recipe in half and baked it in a bread pan – it worked perfectly! But I think next time I’ll cut the sugar in half and leave off the glaze. My boyfriend and I both found it way too sweet for our personal tastes. It was difficult to eat more than a few bites. But otherwise it’s wonderful! I’m glad it worked in the smaller pan and I hope you can find just the right amount of sugar to suit your tastes for next time! Just FYI… when I printed this recipe, the social media links overprinted all the cake ingredients. I had to write them all in! Not a huge deal! 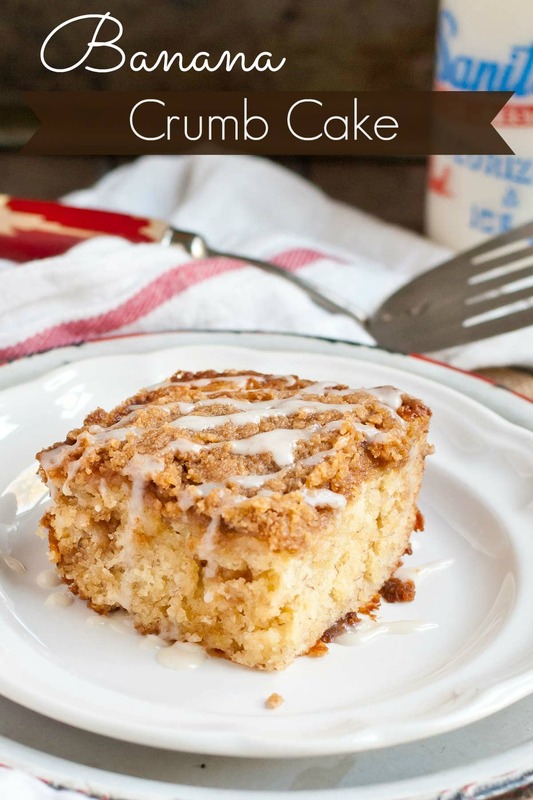 This looks fantastic and my boys love streusel topping cakes and muffins. Thank you for sharing! Trying this tonight! I hope you enjoyed the recipe Ashley! Hmm…it’s tough to know without being in the kitchen with you. Did you split the crumbs up, putting half in the middle of the cake and the other half on top? Yes, and my crumbs were around the pea size that you recommended, but it’s a pretty hot day so maybe the butter didn’t stay as cold as it should have. That could be! Could be oven temp was a little off too. I’m sorry they sunk, but glad it was still delicious. I definitely recommend an oven thermometer…ovens can run all over the place temp wise! This is a super recipe, a great alternative to the usual banana bread solution to overripe bananas! I omitted the glaze and even then found it almost too sweet. Will cut back on the sugar next time. I’ve never made these as cupcakes before, but definitely think it’s worth a try. The cook time will likely be around the 18-22 minute range. Just made this! So excited to try it! Have you ever tried buttermilk instead of milk?? This is by far the best banana anything I have ever made!! This is most definitely a keeper!! This makes me so happy! Thanks for letting me know! Way too sweet! I will cut back on sugar next time. Used almond extract instead of vanilla and used nutmeg with cinnamon for total amount of cinnamon. In my oven, done in 40 minutes. . Great texture! This cake is fabulous!! Took it to work today to share, it was gone quickly! Everyone loved it! Absolutely! Just freeze without the glaze. A new family favorite! OMG! This was so good! Thanks for sharing! P.S. It did need to cook for the 45 min in the recipe and not the 25 min as listed above…thx! I just made this and I have to say, hands down, this is the BEST coffee cake I have ever made. Thank you for sharing this awesome recipe! Woohoo! That makes me so happy! Thanks for coming back to let me know! Such a sweet, rich and moist cake! I live in Kenya and got lots of bananas from my neighbour. I wanted to use them before they went bad and came across this recipe. Had to laugh when I saw the result: the size is real American, huge! But the kids and I don’t mind: we love it! And so did the neighbour who got her own smaller cake! Thanks for sharing the recipe! Thanks so much for sharing! It still surprises and delights me that people halfway across the world are making my recipes. You’re right, this cake could feed an army! I’m glad you were able to share it with friends! Will it turn out with just 3 bananas? It should still work fine with 3 bananas! Holy cow….! 3 cups flour… 1/2 lb butter… 4 CUPS Sugar..!! (In various forms..!) Sounds delish, but I don’t think it’s for me… and no shrinking violet, when it comes to any of these ingredients, but ALL IN THE SAME CAKE… I have to think twice about this..! I was so excited, when I saw 4 bananas… but… maybe another time..!? Absolutely LOVED this recipe!! It turned out so soft and moist. I don’t often have online recipes turn out as good as the pictures make them look, but this one sure did. Definitely a keeper for me, and I will be using it over and over! I am so happy to hear that! Thanks for coming back to let me know! Just made this with my granddaughters and we all agree this is an awesome cake. I had no light brown sugar so I used Demerara sugar! Trust me when I say the crumb topping was EXTRA crunchy!!! I’m so glad you enjoyed it! And I LOVE an extra crunchy topping! Made this tonight! Quite the crowd pleaser! Made this just now, AMAZING. I did make 1 adjustment by using my caramel cheesecake creamer in place of the milk/vanilla in the glaze. Thank you for such a great recipe. That sounds wonderful. So glad you enjoyed the recipe! The yummiest banana cake. Love the icing and the crumb. omgosh I shared with friends and my family loves it. Hello, my sister Clara loves banana bread. So when I saw this banana cake recipe, I had to try it. Wonderful! I hope you and your sister both loved it! Made this today. It turned out great and my husband couldn’t stop raving about it. Thanks for a wonderful recipe. This cake made to my list of favorite desserts since the first time I tried it! Everyone around me loves when I make it! I’ve been topping it with powdered sugar instead of glaze. Still perfect! Definitely a keeper! Thanks so much for sharing this recipe! Could you substitute for unsweetened almond milk instead of regular milk? I tried making this tonight. I cut the recipe in half to fit a 8’ square pan as I only had 2 ripe bananas. My problem was the crumb topping. I did all as recipe suggests but the crumble was very wet. I even added a couple of spoonfuls more of flour but it would not get crumbly. I have had this problem with other recipes. Any suggestions as to what may be wrong? Hmmmm…sometimes this can happen if the butter is too soft. I always recommend starting with very cold butter cubes. Otherwise I’m not quite sure what might have caused this. I hope you were still able to use the crumbs and that the cake turned out well for you!